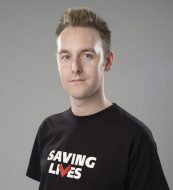 Tom Hayes is the founder and editor of beyondpositive, a community organisation and magazine written by, and for, people living with HIV. Since his HIV diagnosis in 2011 Tom has spoken out in the UK media about HIV related stigma and discrimination, as well as campaigning for increased HIV testing and education of healthcare professionals. Before 2011 Tom worked in data analytics for NHS cancer services in Kent, UK. Over the past two years Tom has also been volunteering as a Community Treatment Advisor at a HIV clinic. Offering peer-led advice on starting ART switching and adherence to patients. As a Saving Lives trustee Tom is passionate about using social media to connect with communities and groups who have not been reached by traditional HIV health promotion messaging techniques. Alongside his trustee role at Saving Lives Tom also holds the following roles: Advisor to European Commission, Advisor to UNAIDS, Community Representative to BHIVA External Relations Group, Platform member MPACT.